Mumps (parotid infection) is an acute viral disease, that is caused by a virus from Pramyxovirus family, is transmitted by droplet mechanism, is characterized by the predominant damage of salivary glands, rarer - other glandular organs (pancreas, testicles, ovaries, pectoral glands and other), and also nervous system. Etiology: an RNA virus, myxovirus parotitis, pathogenic only in humans. Damage of other organs: pancreas, testes, ovaries, thyroid, breasts and meninges. Immune response, elimination of the virus. combined (parotitis + pancreatitis + serous meningitis). degree of toxic syndrome (body temperature, violation of the common state). Incubation period range 11-21 days. Prodromal symptoms are: general malaise, anorexia, and myalgia with a low-grade fewer. They are followed by parotitis; other manifestations may include pancreatitis, oophoritis, orchitis, mastitis, myocarditis, meningoencephalitis and cranial nerve involvement. These symptoms can occur singly, sequentially or concurrently. Parotitis presents as an earache, parotid edema begins with erythema (or usually colorless) and tenderness above the angle of the mandible (during chewing, speaking) within 1-2 days. Edema increases over several days, may cause an upturning of the earlobe (photo). An examination of the buccal mucosa often reveals erytematous and edematous orifices of Wharton`s and Stensens ducts (Positive Moorson sign). Fever may increase to 40 oC. Another parotid gland usually inflamed in 1-2 days. Other signs of mumps tend to occur 1 week or more after the onset of parotid edema. Acute beginning from fever (temperature 38 - 39°С), toxic syndrome. Pain in the area of the damaged gland. Slight swelling in submandibular area. Hyperemia and infiltration in the place of external duct of salivary gland. Often comes with the damage of parotid glands. Orchitis: symptoms include testicular edema and tenderness, nausea, vomiting and fever. In 25 % - is bilateral. Mild atrophy of one testis may develop in many cases. Repeated rising of temperature on 7 - 14 day of illness, toxic syndrome. Previous damage of salivary glands. Pain in a groin increases at walking with an irradiation in a testicle. A testicle is enlarged in sizes; thickened, very painful, skin of scrotum above him is red, shining. Oophoritis is found primarily in post pubertal patients. Mastitis has been described in 1/3 post pubertal females. Meningoencephalitis is one of most significant manifestations of mumps. Meningitis symptoms are: fever, headache, nausea, and vomiting, nuchal rigidity. Encephalitis may present with convulsions, focal neurologic signs, movement disorders, or marked changes in sensory. Muscular weakness, loss or reflexes indicate myelin involvement. Develops secondary on 7 - 10 day of illness, it is combined with the of salivary glands defeat. Toxic syndrome, repeated increase of temperature. Total cerebral syndrome: headache, nausea, repeated vomits, languor. In the cerebro-spinal fluid lymphocytic (95 - 98 %) pleocytosis (hundred, thousand cells in 1 mm3), increased protein (0.99 - 1.98g/l), normal level of sugar, chlorides, increased pressure. Favorable course of the disease. Pancreatitis manifests with upper abdominal pain and tenderness in the epigastrium. Develops secondary on 5 - 7 day of illness, it is combined with the of salivary glands defeat. In coprogram – signs op enzymopathy. Myocarditis occurs primarily in adults, presenting with ECG changes. Joint, thyroid, renal and prostate involvement may also occur. Laboratory tests are usually not helpful. Serum amylase increases. Most laboratories are also no equipped to differentiate between parotid and pancreatic amylase. A lumbar puncture is necessary in a patient with “severe” neurological findings (shows serous meningitis). In the blood – leucopenia (may be leucocytosis in the beginning), relative lymphocytosis, shift to the left, rare – monocytosis, or elevated ESR. Serology: NR, CBR, DHAR, with paired sera. Immune-enzyme method (ELISA) – presence of specific antibodies (Ig M) to the mumps virus. 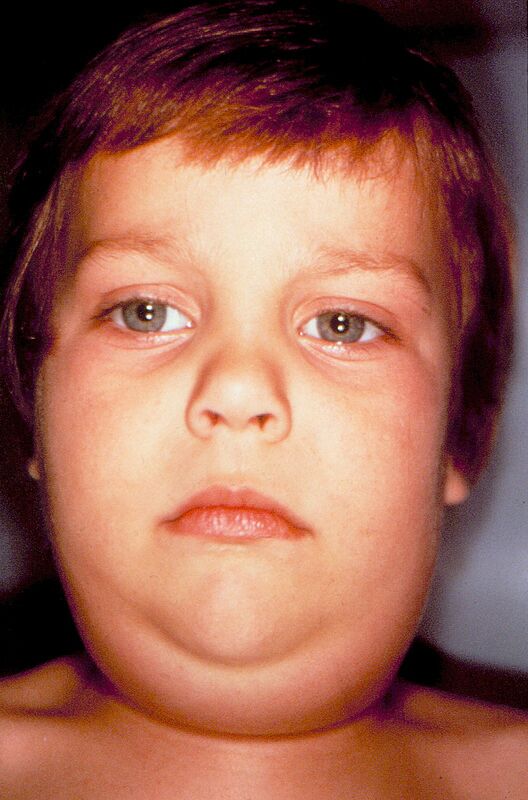 Mumps, typical isolated glandular form (bilateral parotitis, left side submaxillitis), moderate severity, uncomplicated. Mumps, typical poliglandular form (bilateral parotitis, pancreatitis, bilateral orchitis) severe degree, complicated by the bilateral bronchopneumonia. Mumps, typical combined form (bilateral submaxillitis, sublinguitis, meningitis), severe degree, uncomplicated. The viral agents, parainfluenza types 1 and 3, Coxsackie’s – virus A, Epstein-Barr virus (EBV), cytomegalovirus (CMV), and echovirus, may all cause parotitis. Purulent parotitis most often caused by staphylococcus, pneumococcus, or gram-negative bacilli. Noninfectious causes of parotid enlargement include obstruction, tumors, congenital or acquired cysts and drugs such as iodides and phenothiazines. Cervical lymphadenitis, toxic form of diphtheria must be excluded. Treatment is symptomatic. In mild, moderate cases of isolate salivary glands damage home treatment is indicated. Bed regimen up to 7 days. Care for oral cavity (gurgling with 2 % NaHCO3, 5% boric acid, and other antiseptic solutions). Dry heat on the staggered glands. 1 - 2 days hunger, diet №5 for 10 - 12 days. Detoxication therapy (orally, IV: crioplasm, albumen, 5% glucose, physiologic sodium chloride solution). Spasmolytics for the pain syndrome decrease (nospani, papaverini). Enzymic preparations (pancreatin, creon, pangrol, digestin). Bed regimen up to 10 days, suspensorium. Glucocorticoids 2-3 mg/kg (in equivalent to prednisolone) in 3 - 4 receptions 3 - 4 days, gradual diminishment of dose, course 7 - 10 days. Brest feeding or bottle feeding by adopted formulas for infants, in the first day 1/2-1/3 of average volume with a next increase to the complete volume during 2-3rd days, in case of impaired swallowing – nasogastric tube feeding. In case of seizures – Anticonvulsant therapy: benzodiasepins (seduxenum, sibasonum) 0.3-0.5 mg/kg IV, if they are ineffective – 1 % hexenalum or thiopenthalum sodii in 3-5 mg/kg IV. Dehydration therapy: lasix 2-3 mg/kg IM or IV. • Recombined interpheron for 7-10 days. • Antiviral medicine (innosini pranobex – 50 mg/kg). Isolation of contacts (aged to 10 years, not vaccinated, and were not ill before), from 11 till 22 day after the contact: examination, temperature measuring. Vaccination by a living mumps vaccine (or combined MMR vaccine together with vaccination against measles, rubella) in 12-15 months. Revaccination - in 6 years, if was not done - in 11 years; in 15 years - monovaccine (boys). Key words and phrases: mumps infectious parotitis, earlobe, orifices of Wharton’s and Stensen’s ducts, parotid edema, orchitis, oophoritis, mastitis, meningoencephalitis, meningitis, encephalitis, pancreatitis, myocarditis, lumbar puncture.